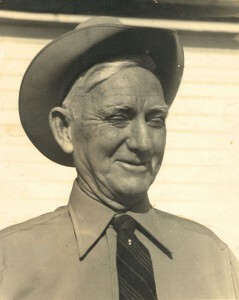 Rancher and cattleman Ed Rachal, Jr. was born in Rockport, Texas on July 12, 1878. He was christened Edward Rene Rachal after his French father. His mother was also of French extraction. She was Louise “Lula” Perrenot of Rockport. Her parents had come from Alsace-Lorraine stopping first in Florida. They moved to South Texas in the mid-nineteenth century. Rachal’s early years were spent learning the skills of a cowman – roping, riding, branding cattle, even rope twirling. He was well read, and after attending Bayview College for several years, was part of its first graduating class. Just before the turn of the century, at the age of about twenty, he arrived in Falfurrias by way of Oklahoma, where he had ridden on a cattle drive sometime in the 1890’s. He went to work on the Santa Rosa Ranch, east of Falfurrias, and in 1904 his parents, brothers and sisters followed him there. The entire Rachal family cherished the land and were always deeply involved in stock raising and planting. Ed Rachal’s father had the first citrus orchard in Falfurrias. On October 9, 1912 Ed Rachal married Miss Louise Allen of Wolf Creek, Tennessee. She had come to Falfurrias with her sister Helen to teach school. Louise Rebecca Allen was born at Wolf Creek, Tennessee on November 7, 1887. After attending local schools there she attended Nashville University where she earned a diploma of licentiate in 1909. Ed Rachal and his wife Louise loved children, though they had none of their own. They cared for their nephew and niece after the children’s mother died. They often invited young people to borrow books and ride their horses, and hosted frequent square dances and other entertainment for them. The Rachals also believed deeply in education, and this combination of commitments to education and youth, and to the land and its resources, is the cornerstone of the Ed Rachal Foundation’s mission.